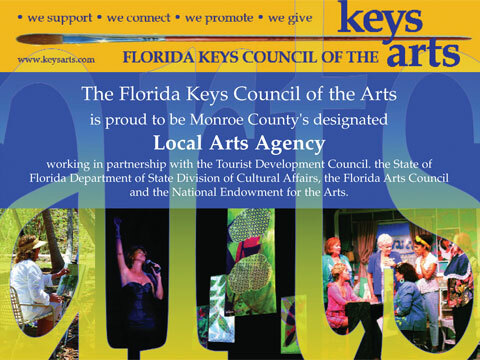 The Florida Keys Council of the Arts is the leading arts and cultural organization in the Florida Keys. As the non-profit local arts agency in Monroe County it connects audiences from around the world to galleries, theaters, museums, festivals, dance, music and more from Key Largo to Key West. FKCA makes grants, supports Art in Public Places, and promotes the destination for its rich and diverse history in art and culture. The Arts Council provides services to visual and performing artists, arts organizations, students and the public, striving to instill a passion for and participation in the arts. The vision of FKCA is to enrich the arts and enhance the cultural heritage of the Florida Keys. The mission of the FKCA is to advance the creative development and promotion of the arts in our cultural community by providing excellence in leadership, advocacy, education and financial support for artists, cultural organizations, and citizens of Monroe county.